This semester, Joyce Kincannon and I are both facilitating two separate faculty learning communities on blended learning. I am also trying to wrap my brain around the whole MOOC thing. So what better way than to sign up for a MOOC on blended learning! Joyce is taking it too, so we will see if we can keep each other on task. (This while co-teaching our online faculty development course, Preparing to Teach Online). 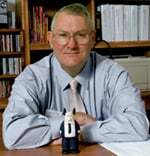 Kelvin Thompson of University of Central Florida will be directing / teaching / facilitating this course, which runs September 24 through October 29. Kelvin has set up a Twitter hashtag – #BlendKit2012 – to help with communication and socializing. I am looking forward to seeing just how Kelvin manages this “class”. I also look forward to “meeting” some new people through the tweets and blog commentary. Great questions. It also leads to a caveat – will your hours face-to-face (and online) be dictated by room scheduling? 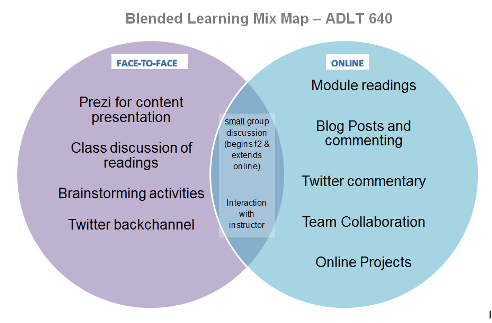 I designed a blended approach for my summer course, but that required face-to-face meetings at the beginning and end of the term, and a significant online portion in the middle. It would not work if one took a twice a week course and made it meet once a week with an online component. How often will you meet with students face-to-face? How many hours per week will students be engaged online, and how many hours per week will students meet face-to-face? Is the total amount of student time commitment consistent with the total time commitment of comparable courses taught in other modalities (e.g., face-to-face)? 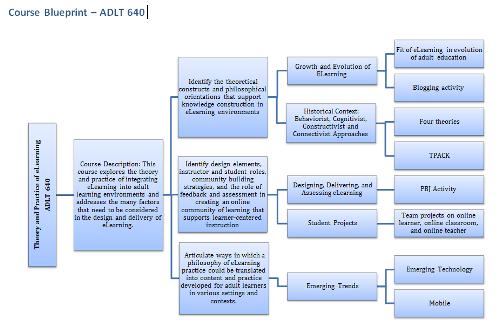 Kelvin asked us to put together two maps of courses we might further develop as blended courses, so I am using ADLT 640 – The Theory and Practice of eLearning. What about adding in some synchronous sessions for the whole class during the online portion, esp. to continue discussions of the readings?